Leveraging on our enormous commercial experience, our firm is indulged in exportingCorporate ID Cards. Our provided cards are developed by using the top quality raw stuff which is purchased from industry certified suppliers of the market. Besides this, our I-cards are processed by accomplished experts, who have rich skill about this arena. Moreover, we offer all our I-Cards in different specifications as per the requirements of institutes and offices. Leveraging on our enormous commercial experience, our firm is indulged in exporting Corporate ID Cards. Our provided cards are developed by using the top quality raw stuff which is purchased from industry certified suppliers of the market. Besides this, our I-cards are processed by accomplished experts, who have rich skill about this arena. 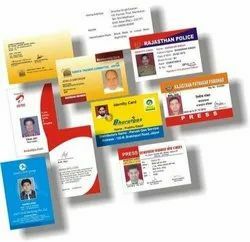 Moreover, we offer all our I-Cards in different specifications as per the requirements of institutes and offices.